The voter turnout in San Diego County is on-track to reach 65% based on 798,429 ballots cast and 356,000 outstanding ballots left to be counted in San Diego County as of November 11, 2018. The last time a midterm election reached 60% was in 2010 when turnout was 64.23%. In a race where incumbent Senator Joel Anderson (CA State Senate D38), who termed out, had enjoyed an average 34% point advantage, Democrat candidate Jeff Griffith narrowed the margin to 10% point (24,955 votes) against Republican candidate Brian Jones. US House of Representatives are elected to 2-years terms. 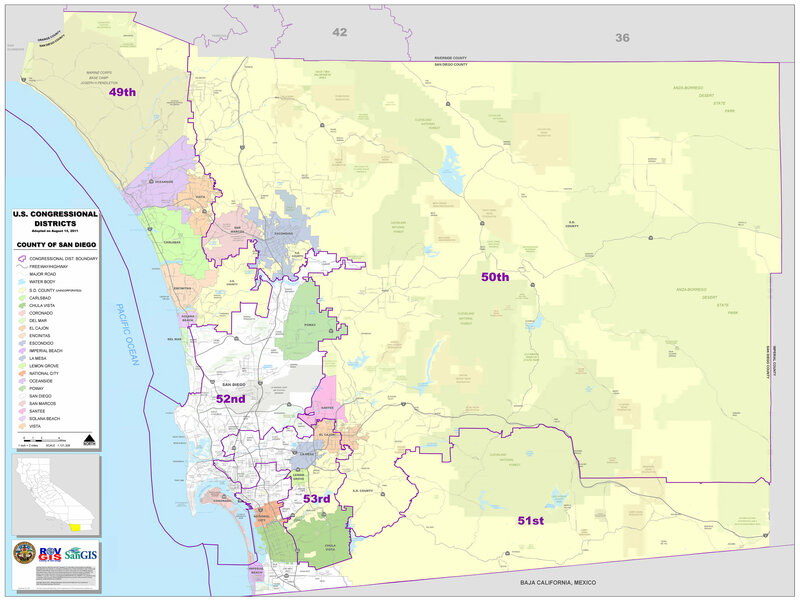 California US Congressional District 50 includes Escondido. The current representative, Duncan D. Hunter (Republican, Alpine), has been US House of Representative member of California’s 50th District (previously 52nd) since 2009 for 5 two-year terms. Since he first ran for congress in 2008, Representative Duncan D. Hunter had enjoyed on average 30% point advantage against his 2nd place his challengers. But this year, challenger Ammar Campa-Najjar is only trailing by 6.4% point (11,488 votes) as of November 11, 2018 with 356,000 outstanding ballots left to be counted in San Diego County. Escondido Mayor and City Councilmembers are elected to serve 4-years terms. In 2013, Escondido was 4 drawn into council districts as a result of a consent decree. So since then, the election for Mayor, District 1 and District 2 are held during the Governor General Election (Midterm, e.g. 2018, 2014, 2010) while District 3 and District 4 are held during the President General Election (e.g. 2016, 2012). The numbers for voter turnout in Escondido for 2018 hasn’t been published, but based on the total number of votes in the mayor race, it will most likely reach 30,000 (60%) as well. The current mayor, Sam Abed (Republican), has been Mayor of Escondido since 2011 for 2 four-years terms. Before that, he was City Councilmember of Escondido for 1 1/2 four-years terms (2004, 2008). In 2014, Mayor Sam Abed had enjoyed a 23.75% point advantage against his 2nd place challenger. But this year, challenger Paul “Mac” McNamara is only trailing by 0.32% point (94 votes!) as of November 11, 2018 with 356,000 outstanding ballots left to be counted in San Diego County. The current city councilmember, Ed Gallo (Republican), has been the City Councilmember of District 1 since 2001 for 4 four-years terms (2000, 2004, 2010, 2014). He is part of a city council majority that pursued discriminatory policies toward immigrants and turned Escondido into one of the toughest anti-immigration city in the country as well as closing the Escondido East Valley Public Branch Library and outsourcing library operations of Escondido Public Library to an out-of-state company, Library Systems and Services. He also approved in 2017 a water treatment plant location in his district directly adjacent to residential areas. In 2014, City Councilmember Ed Gallo (Republican) had held off challenger Consuelo Martinez by 1.09% point (69 votes! ), but this year, candidate Consuelo Martinez is leading by 20.42% point (756 votes) as of November 11, 2018 with 356,000 outstanding ballots left to be counted in San Diego County. The current city councilmember, John Masson (Republican), has been the City Councilmember of District 2 since 2015 for 2 1/2 four-years term. He was appointed to the City Council when the then City Councilmember Marie Waldron was elected to the State Assembly in 2012. He is part of a city council majority that pursued discriminatory policies toward immigrants and turned Escondido into one of the toughest anti-immigration city in the country as well as closing the Escondido East Valley Public Branch Library and outsourcing library operations of Escondido Public Library to an out-of-state company, Library Systems and Services. In 2014, City Councilmember John Masson had enjoyed a 25.14% point advantage against his 2nd place challenger. But this year, challenger Vanessa Valenzuela has narrowed the margin to 16.66% point (1,439 votes) as of November 11, 2018 with 356,000 outstanding ballots left to be counted in San Diego County. California State Assemblymembers are elected to 2-years terms, and they are limited to 6 terms (or 12 years combination in state legislature as state senator or assemblymembers). California State Assembly District 75 includes Escondido. The current state assemblymember, Marie Waldron (Republican, Escondido), has been Assemblymember since 2013 for 3 two-years term. Before that, she was a city councilmember of Escondido for 3 1/2 four-years terms (1998, 2002, 2006, 2010). The city council had passed the ordinance, but fortunately, “[d]ue to a lawsuit and temporary injunction by a federal judge, the city rescinded the ordinance in December 2006. [17a, b, c, d]” However, her legacy remains: she was part of a city council majority that pursued discriminatory policies toward immigrants and turned Escondido into one of the toughest anti-immigration city in the country. Since she first ran for state assembly in 2012, Assemblymember Marie Waldron had usually enjoyed an average 30% point advantage against his challengers. But this year, challenger Alan Geraci has narrowed the margin to 16% point (17,673) as of November 11, 2018 with 356,000 outstanding ballots left to be counted in San Diego County. California State Senators are elected for 4-years terms, and if elected 2012 and after they are limited to 3 terms (or 12 years combination in state legislature as state senator or assemblymembers). If elected prior to 2012, they are limited to 2 terms (8 years). California State Senate District 38 includes Escondido. The current state senator, Joel Anderson (Republican, Alpine), has been Senator of the 38th District (previously 36th) since 2011 for 2 four-years term. However, he termed out and so for this year’s 2018 election, a new state senator is being elected: Brian Jones (Republican) vs. Jeff Griffith (Democrat). When he ran for state senate, Senator Joel Anderson had enjoyed an average 34% point advantage. But this year, Democrat candidate Jeff Griffith narrowed the margin to 10% point (24,955 votes) against Republican candidate Brian Jones as of November 11, 2018 with 356,000 outstanding ballots left to be counted in San Diego County. As for Senator Joel Anderson, he ran for Board of Equalization 4th District. Democrat candidate Mike Schaefer is only trailing by a narrow 0.4% point (17,491 votes) margin against him as of November 11, 2018 with 356,000 outstanding ballots left to be counted in San Diego County. ETA: See Voice of San Diego’s Sacramento Report: With Anderson Incident, Board of Equalization Race Just Got Even Weirder for a summary of the Board of Equalization 4th District race.